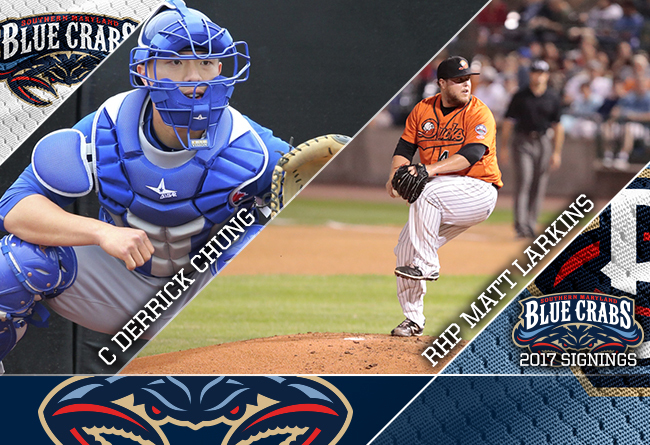 (Waldorf, Md., Feb. 16, 2017) – The Blue Crabs announced the signings of catcher Derrick Chung and right-handed pitcher Matt Larkins to the 2017, 10th anniversary season roster on Thursday. Derrick Chung was drafted in 2012 by the Toronto Blue Jays out of California State University Sacramento. The 2017 season will be his first with the Atlantic League. The career .274 hitter has been part of the Jays’ farm system since being drafted, going as high as AA New Hampshire in 2014 and 2015. A graduate of the Arizona Fall League, Chung’s batting ability is rivaled by his ability behind the plate. The 28-year-old Garden Grove, California native has a remarkable career 42% caught stealing percentage, making his arm just as valuable as his bat and glove. Matt Larkins joins the Blue Crabs after making his Atlantic League debut with Long Island in 2016. The right-handed pitcher logged 3.21 ERA in two games he started with the Ducks. The Australian born 27-year-old has spent time in the American Association spanning from 2012 through 2016. Larkins allowed only five home runs during his 2016 stint with the Lincoln Saltdogs of the American Association. He struck out 83 batters in 138.1 IP in Lincoln and Long Island during 2016. The Blue Crabs open up the 2017 season on April 20th in Waldorf, MD versus the Long Island Ducks. For information regarding tickets and other team news, visit www.somdbluecrabs.com or call 301-638-9788. The Blue Crabs play 140 regular season games in the Atlantic League of Professional Baseball Clubs. The Blue Crabs play at Regency Furniture Stadium in Waldorf, Maryland with affordable family fun. The franchise will open its tenth anniversary season on Thursday April 20, 2017. Please call 301-638-9788 or visit www.somdbluecrabs.com for more information and to reserve your seat at the ballpark today!